In the old days many diseases werenot so much the result of poorly developed medicine, many lack even the most minimal knowledge about the importance of sanitation and hygiene. The first step towards civilization was a device in the streets of the city sewage. Go back to the unenlightened past and foul-smelling nobody hunting, so even in the most remote areas people are thinking about settling his life at the proper level. Consider the most affordable option in financial terms, namely, how to set a sinkhole with his hands. Before you begin to address the question of howmake a cesspool, you must perform a number of preliminary calculations and measurements. You must first decide from which it will be made of material storage capacitance. The most popular are the concrete and plastic. In addition, there are also specific rules for placement of structures. Firstly, the cesspool in the country orhouses adjoining the site should be located at a distance of at least 5 meters from the apartment building. 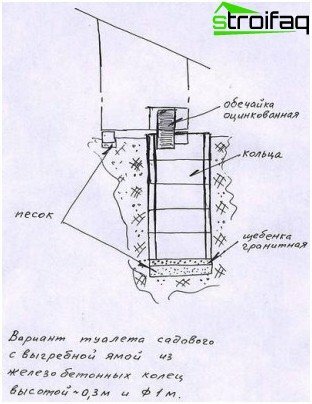 Secondly, if the area available on other similar wells and structures, the container must be positioned at least 30 meters away. 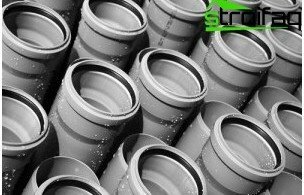 Thirdly, the presence of high groundwater runs require ground-pipe design, rather than the standard - underground. 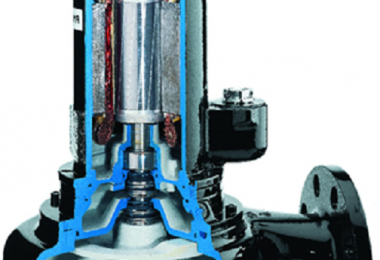 Fourth, the installation model requires systematic pumping is necessary to equip the machine free access to it. 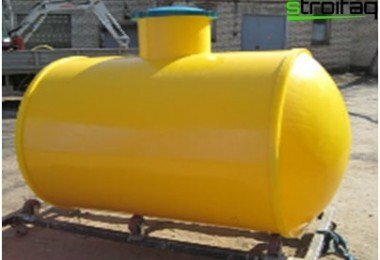 Fifth, the quality of the tubes passing sewage holding tank should be positioned so that the pipe passing it along a straight path or with a minimum number of turns. By selecting a specific device sump,should be calculated at what height will be located in the input capacitance of the pipeline. Then they pulled out a pipe trench and pit for the drive. 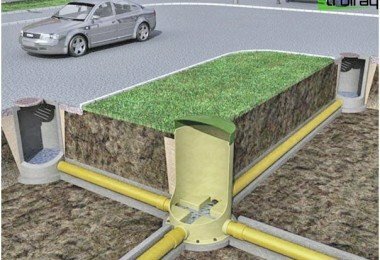 Note that when the underground passage of the pipes necessary depth of emplacement is 1 m (20 cm will be spent on the gravel and sand cushion). This is done to ensure that upon the occurrence of cold water contained inside is not frozen, thereby violating the integrity of the pipe and secure flow of sewage. When the problem of freezing ground location of the pipeline is all too keenly. 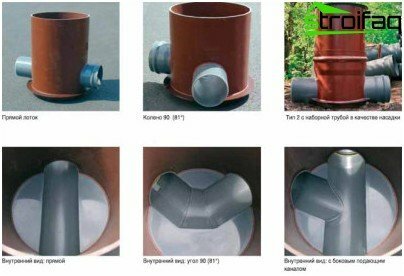 A partial solution might be surface shelter pipe insulation materials. The design of this material may beperformed in two ways. Through the first we get the building, requiring a systematic evacuation of content, thanks to the second - the construction of which generally does not require pumping. The construction of the sump, both the first and the second option, with the same manipulation. Step by step process is as follows. We pull out a pit under the tank. It is desirable that its wall located at a distance of 1 m from it (this distance will provide us with free access to the structure from all sides). The bottom should be well aligned. The most appropriate way - leveling floor screed. On the leveled surface of the first set of future storage container - concrete ring and the bottom of the points of the upper part (diameter - 1-2 m). Next, a second detail - concrete ring with retaining projections for the hatch at the top (diameter - 0.7-0.8 m). As the use of the seal rubber (pitched or chamber). Punched puncher in the lower ring of two openings under the air intake and at the entrance to the sewage. Set the pipe for the outlet of gases, and is also connected sewer. The joints are sealed connection solution. After it is completely dry the entire surface structures treated with liquid glass. This cesspool of concrete rings do notIt requires pumping the contents. It consists of two vessels, the first of which is the primary treatment of wastewater, and the second - final. The output is water that does not harm the environment and can be discharged into the nearest body of water. Installation of the first tank was considered above. The only clarification: in the fifth paragraph, instead of two holes three breaks. The third hole is necessary for the contents of the output in the second cleaning tank. This hole is located 25 cm below the inlet. Above all placed under the air intake opening. The entire process of assembly of the second container is as follows. Pulls out a pit 50 cm wider than the tank diameter. Below him create gravel cushion thickness of 20 cm. On her first ring set (dimensions are similar to the first embodiment) without a bottom. At the bottom of the first ring drilled with two sides, two output ports. In the upper part - a hole for water inlet and air inlet. The second element is set to the same compactor. Produced daubing joint solution (liquid glass in this case it is not necessary). The inner ring is half filled with gravel and another quarter-stone striker. Outside the inner ring is filled to three-quarters of gravel. Then he made his final filling of the ground. Mounted cesspool of plastic is muchlighter than concrete. 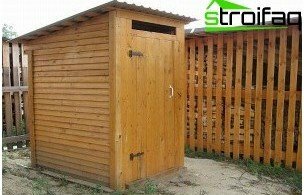 But it has two major drawbacks: it can not be hidden under the ground and it is always presented only in the form of storage (requires pumping). The walls of the excavated pit must be located at least 30 cm from the surface of the tank. Capacity is only installed on the leveled surface (or sand cushion or concrete screed). The tank must be equipped with additional elements: the ventilation pipe and the float-beacon (signals the filling capacity). After installing the tank on the preparedarea is necessary to make it fit. 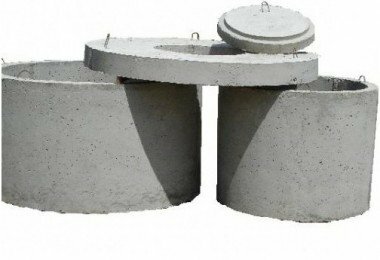 Clean water tank is filled (height about 15 cm) and attached to the outside of the support area with a solution (cement and sand). 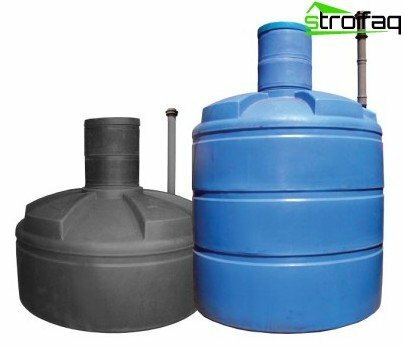 On the surface of the tank should not impose any load. Cover it with earth is strictly prohibited. 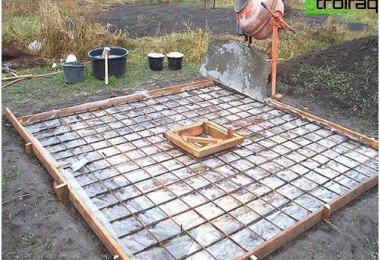 Now learn how to make a cesspoolpit, it is safe to conclude that these works are not that complicated. If not generously flavored with job carelessness and haste, then eventually you can get a complete drainage system, which will serve you for many years.